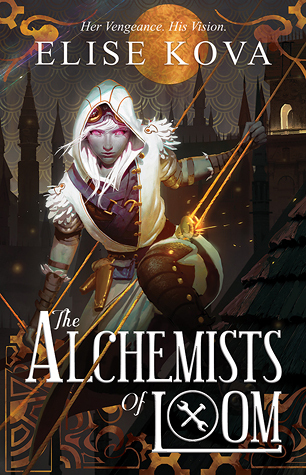 The Alchemists of Loom by Elise Kova is one of my most anticipated releases for 2017. When I received an ARC from Keymaster Press, I was more then happy to dive in. This book proved to be everything I thought it would be and more. So today I am very excited to be sharing my review with you all. Let's venture back into the world of Elise Kova's writing with her brand new Adult high fantasy series. Back when I had heard of Elise's first musings about Loom, I couldn't soak in enough information. However now that I have finally read the book I realize that one can never soak in enough when it come to this brilliant authors writing style. The characters are lifted off the page, and the world of Loom is written so well that it becomes like a real place. We as witness see such development throughout the entire novel. With being the first book sometimes it is hard to paint or in this case write a clear picture. However Loom had none of those problems. It was a written in a way that readers will be able to understand and love. From what I can tell, The Alchemists of Loom is now one of my top reads of 2016. We travel into the world of Loom and within the first few chapters we are thrown into the dangerous world Ari (one of the main characters) lives as her reality. We see a order of one race ruling another in one power hungry mix. We have the dragons, and then the civilians of the guilds. The Guilds are a way to keep order, a place where everyone belongs. Each guild has a brand and each member must bare a tattoo upon their cheeks to identify themselves. The Guilds should be run by those living on Loom? Correct? Unfortunately that's not the case. For the stronger survive, and the Dragons of Nova have powers beyond ones imagination. The powers these dragons have come from parts of a dragons body, which makes them in high demand for organs harvesters. Which in turn makes for a suspenseful feud between those of Loom and Nova. Ari is one of those living in the shadows and is a deadly harvester, but what happens when she must team up with an individual she is sworn to hating? The Alchemists of Loom plot line was well planned out and well organized throughout. Not only did it have things going on in the back ground that stuck out just as much as the main events, but it also had a way of molding all together perfectly. The ideas were original and fresh. It had combinations of steampunk, magic, and dragons all working together to form brand new story elements. We, as readers are taken on an adventure as we read to discover what truths the world of Loom really hold. To go along with the complexity of such an unique story-line, we had a even more complex setting. Not only did Elise Kova craft one really intricate land mass full of systems and order, she technically crafted two. The floating Land of Nova where all the Dragons resided and ruled . Each land mass was mesmerizing. Loom had it's network system of Guilds and Nova had it's network system of Dragon Houses. We didn't even get into all the depths of either places, and yet I still felt completely knowledgeable about both. With the world of Loom it makes me excited to see what areas will be discovered next. Now the last thing that absolutely sold The Alchemists of Loom as my favourite book of the year were the characters. Each had a story unique to themselves. Each had views and ideas that set them individual to the others. The Alchemists of Loom had alternating POV's for each chapter. Now sometimes author can mess this up completely, and things can get very confusing. However Kova showed each character uniquely, and each character voice was clear and crisp. I feel confident enough to say that it was so clear, that if someone had read Loom, then was blind folded and read a passage. They could decipher which character was leading that specific chapter. To say the least we get a clear understanding of the characters outlined and portrayed. In conclusion, this book deserves all the praise it is receiving. Not only is it absolutely enchanting, it's also devilish dangerous. The world of Loom is one to be reckoned with, and Elise Kova has done it yet again in creating a masterpiece of a novel. Are you excited for The Alchemists of Loom? What has been your favourite read of 2016?